The land was cleared and a garden was planned and planted. Before this the area was a barren wasteland, scraggly old pines, weeds, and an abandoned rubbish pit littered with broken glass, rusted steel drums and half-burnt plastic bags. Many plant species did not survive the first few years, but as the shelter has grown, so have their chances of surviving our extreme climate. This sign was erected some years after the garden had been planted. Walk past the sign now and you are surrounded by well-established and thriving flora. 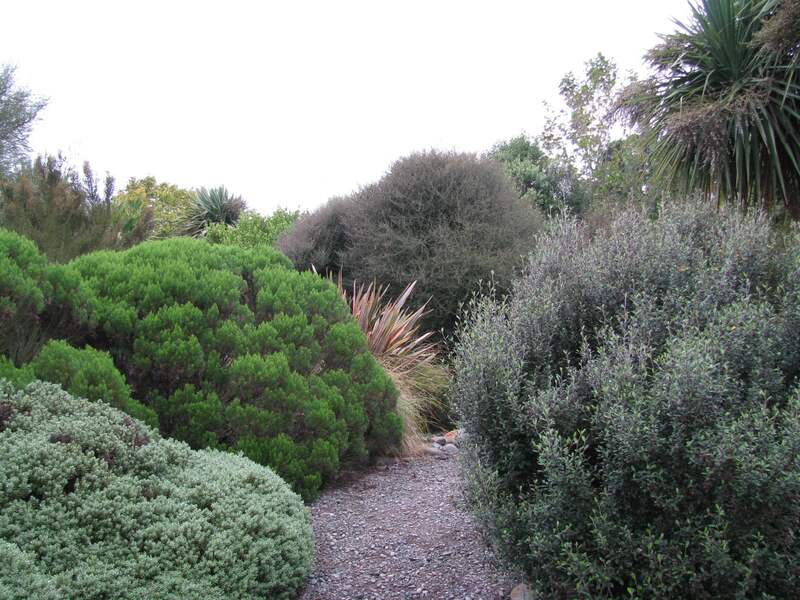 Ground covers, trees and shrubs, all New Zealand natives, create a harmonious symphony of colours, textures and smells that change reflecting the light and season. In the foreground is low-growing Hebe canterburiensis. The trees to the left are Plagianthus regius or lowland ribbonwoods, while those in the background are New Zealand Red Beech. Follow the winding paths made from locally sourced river shingle and be captivated by the diverse colours and textures of the unique New Zealand bush. On the left are two very different looking Hebes. 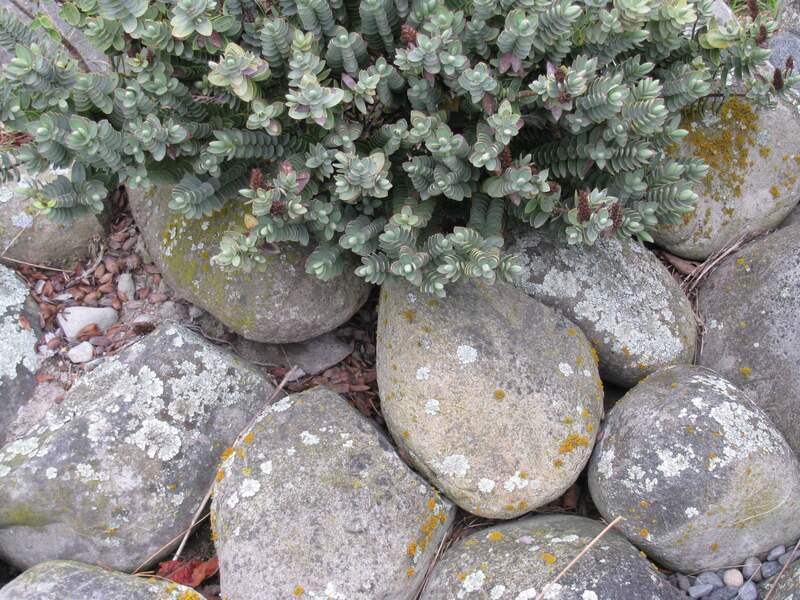 The smaller one has the greyish-glaucus leaf colour common in Hebes and stays looking good even when it is not flowering. Behind it is a larger whip-cord Hebe, while across the path are Corokia and Coprosma species. Look up along any of our paths to spot some of the most iconic plant species of the New Zealand landscape. 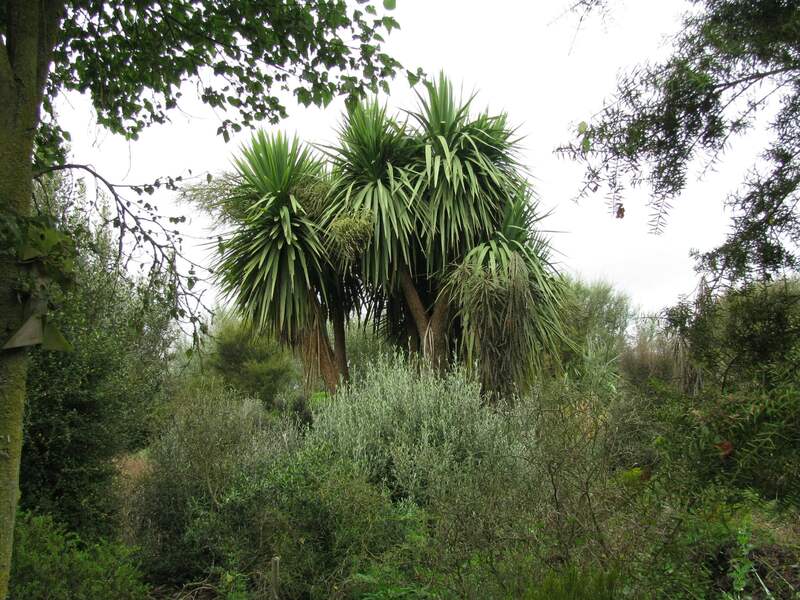 Cordyline Australis, also called Cabbage Tree or Ti Kouka is one example, hard to miss with its strong trunk and terminal clusters of sword-shaped leaves. In early summer they bear lovely scented flowers which later turn into berries that birds love to eat. New leaves from the plant’s centre were eaten by Maori in times of need. 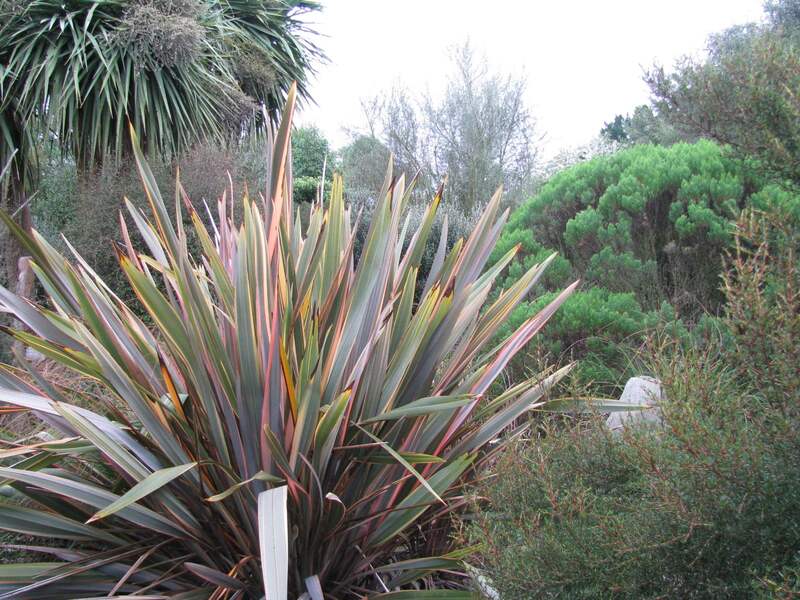 Phormium tenax, or Harakeke in Maori, is a most useful plant whose fibre is still used for weaving ropes, baskets and clothing today as it was hundreds of years ago. It has long sword-like leaves and is usually found growing in its natural habitat in low-lying ground. The specimen shown here is a variegated cultivar, wild varieties being usually a solid shade of green. The name Phormium comes from Ancient Greek for "basket", while tenax was Latin for "strong". Plants with divaricating or inwardly tangled growth are unique to New Zealand. 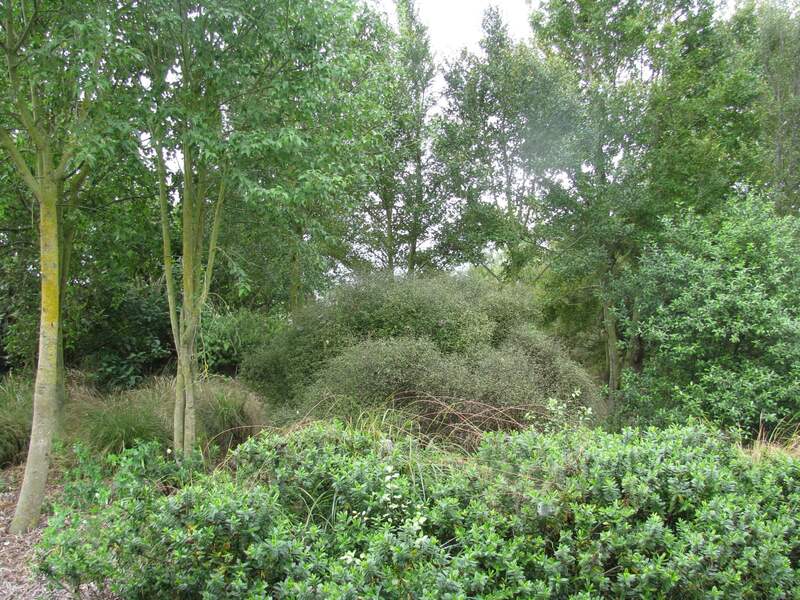 Some plants only have this protective, divaricating growth habit when they are young, while others such as the above Muehlenbeckia Astonii shrub maintain this habit throughout their life. 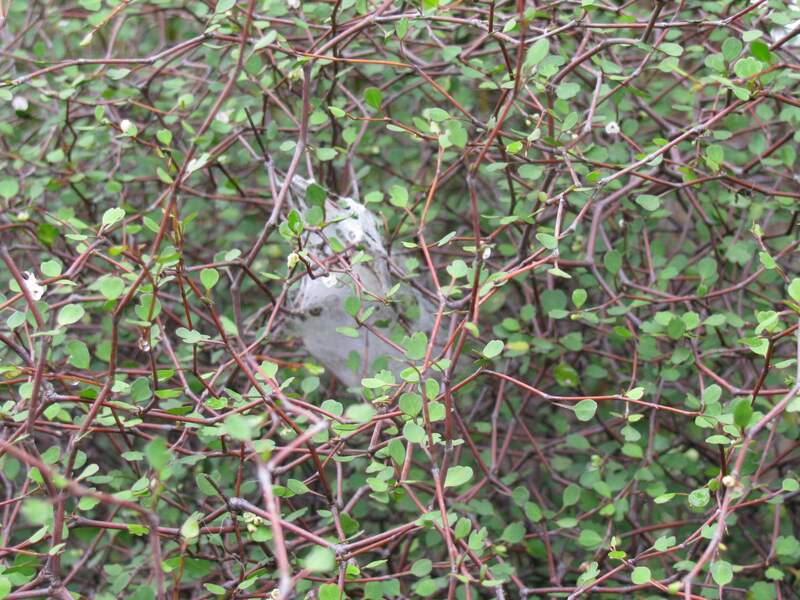 The tangled growth of this plant provides an ideal site for a spider nursery. They also provide habitats for New Zealand wetas and our unique native geckos. The smooth rounded stones from the Rangitata River abound on the plains around the Rangitata area. They have been used to edge the paths around the gardens and in places as mulch on the garden. The stones suppress weeds, store heat and provide a warm and protective habitat for native skinks which live in our area. They also make beautiful stone walls for those with the time and inclination to engage in some weekend stonemasonry. Speckled sedge, Carex testacea, or just plain old tussock grass, is perfectly suited to our dry exposed conditions and can colonise areas where nothing else will grow, including areas under already growing plants, with surprising speed. 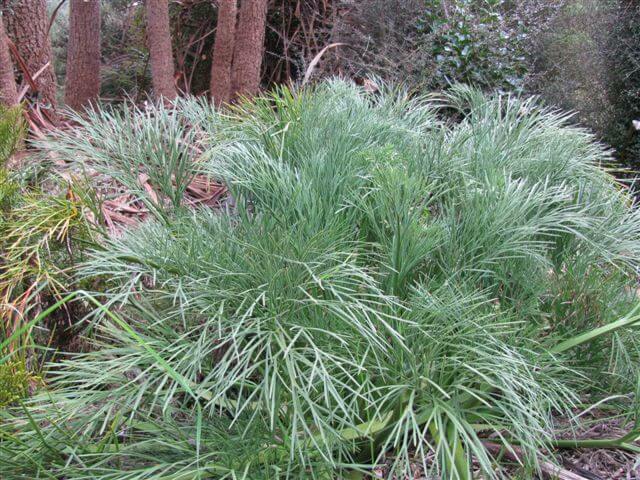 This dense grass is recognised by its warm orange leaf tips atop vivid green mature foliage. Growing to over half-a-metre tall, they produce a haze of wispy seed stalks popular with birds in summer. 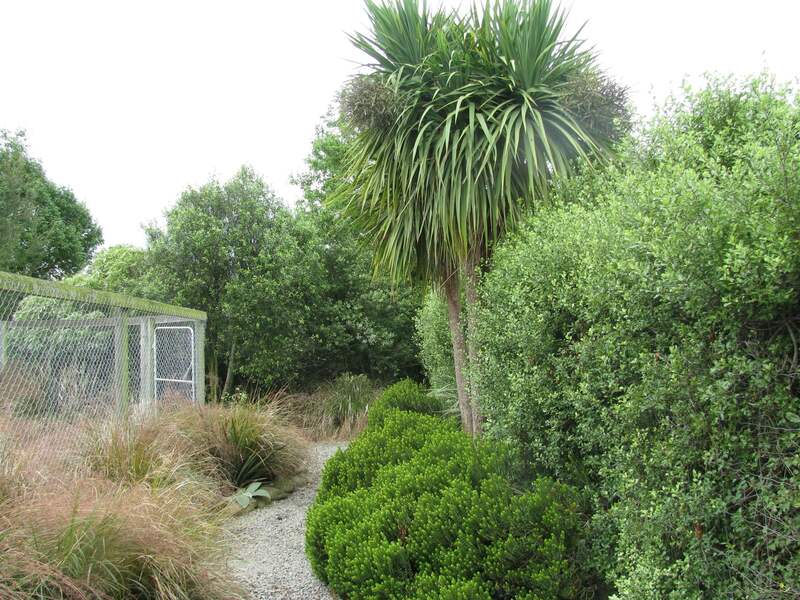 Aciphylla Diefenbachii is a small plant that is endemic to the Chatham Islands off the coast of Canterbury. It is classified as nationally vulnerable as animal grazing has reduced the natural areas in which it once grows. Now propagated mainly for home gardens, it is an attractive feature plant with dramatic pointed and deeply divided leaves. In summer it produces a spectacular acid yellow flower-head on a metre long stem. 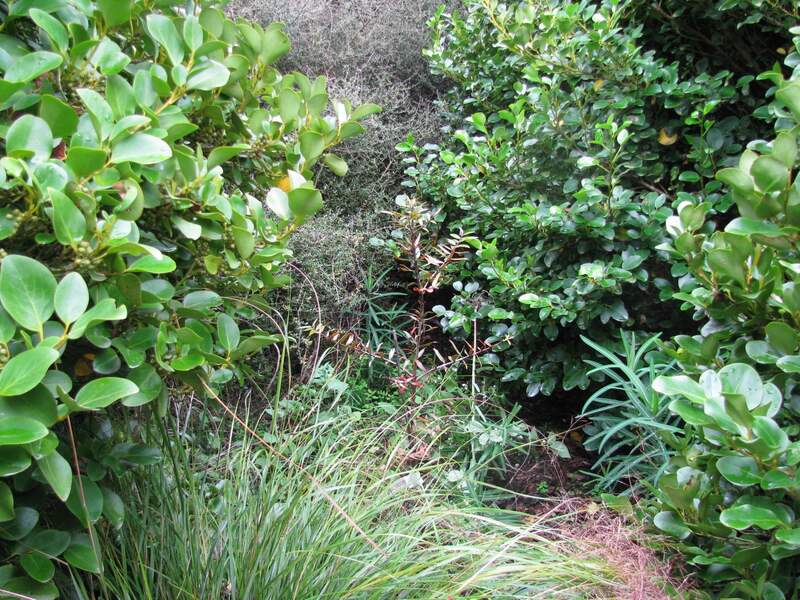 Although the Kauri, Agathis Australis, is endemic to parts of the North Island it is thriving here in a sheltered micro-climate created by the protective cover of other shrubs such as the broadleaf bushes shown here. This tiny Kauri will one day tower over its companions. In their natural habitat Kauri can live over 2000 years and grow up to 50 metres tall and 16 metres wide. They were excellent trees for boat-building. 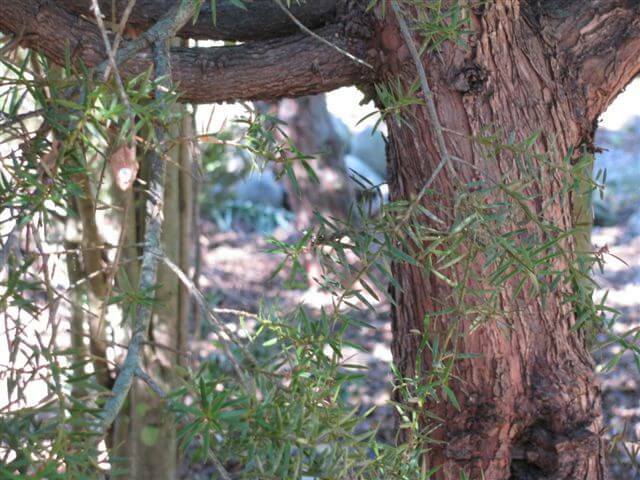 This close-up of a young Totara shows the stringy bark characteristic of this tree. It can be found growing in most parts of the country. We have several Totara grown from locally-sourced seeds. It is a tall-growing conifer, reaching up to 35 metres tall and living for over 900 years. Its heart wood is extremely durable and is used traditionally by Maori for carving and building waka or war canoes. Its durability also made it perfect for fence posts. 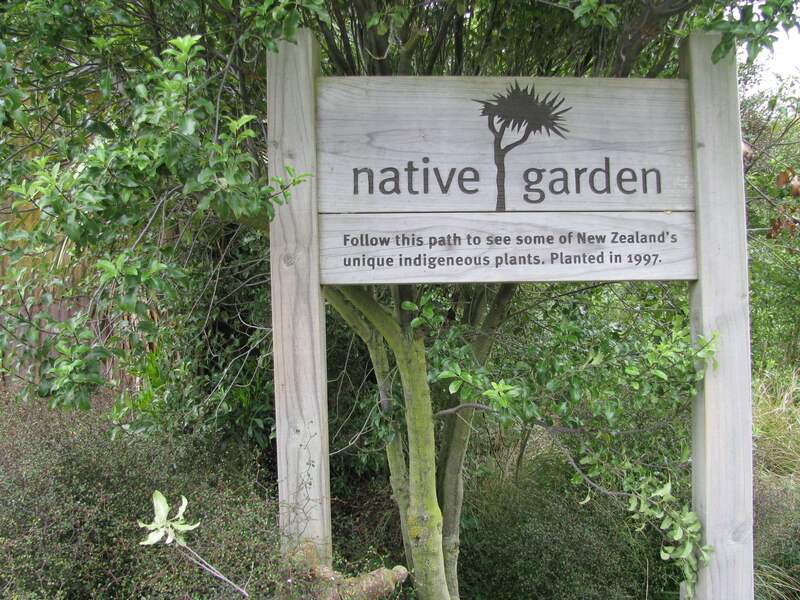 Wander out of the gardens towards the hen enclosures and you will see many more New Zealand trees, shrubs and grasses growing in the enclosures and along the paths. 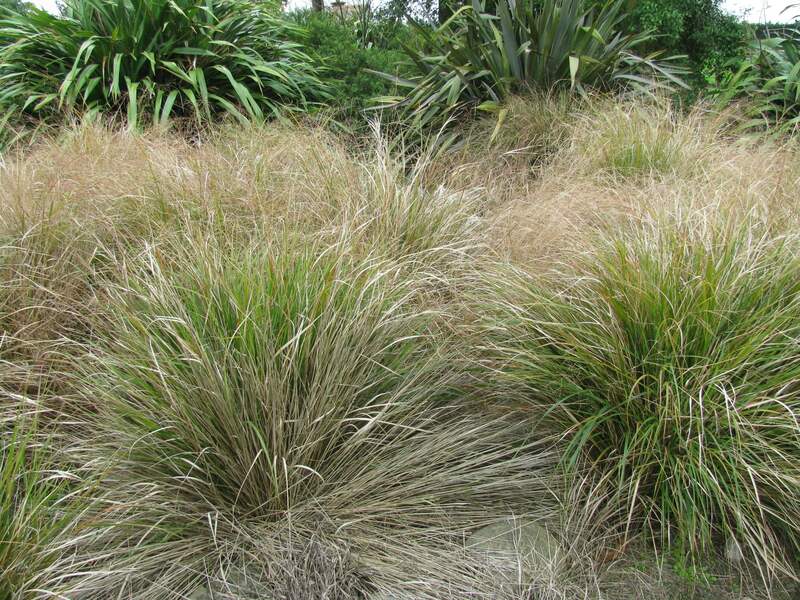 The plants we chose, such as the Gossamer Grass Anamanthele lessoni, are hardy and require no watering or special care even in the dry Canterbury summers. We prefer plants grown from local seeds as plants tend to inherit their parent’s adaptations to a specific climate. The beautiful yellow flowers of the Kowhai, Sophora Microphylla are welcomed when they appear as one of the first signs of spring. In many species flowers emerge in early spring from the bare branches which have lost all their leaves by late winter. The bright colour of the flowers attracts birds which enjoy the nectar and ensure pollination. The wood of Kowhai is dense and strong and has been used in the past for tools and machinery. 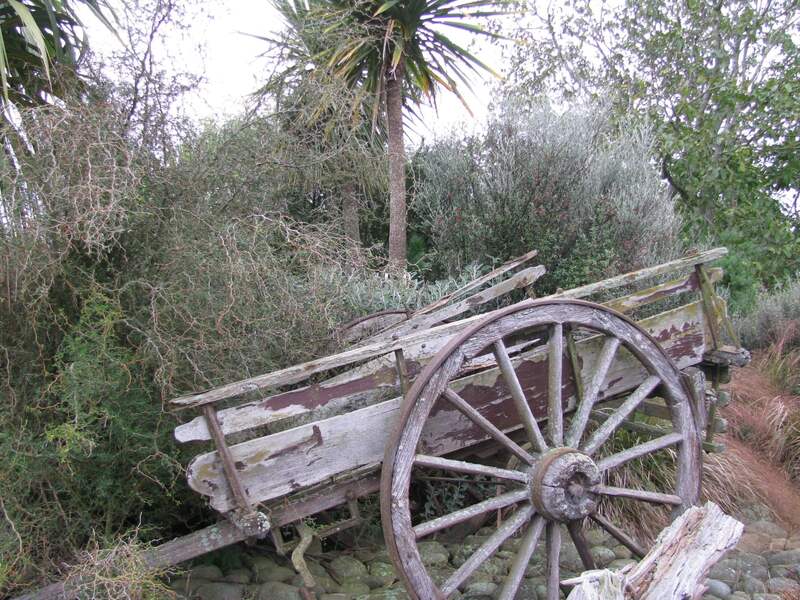 To the left as you leave the Tin Shed you see an old wooden horse-cart, now overrun by a vigorous divaricating Kowhai, or Sophora prostrata. 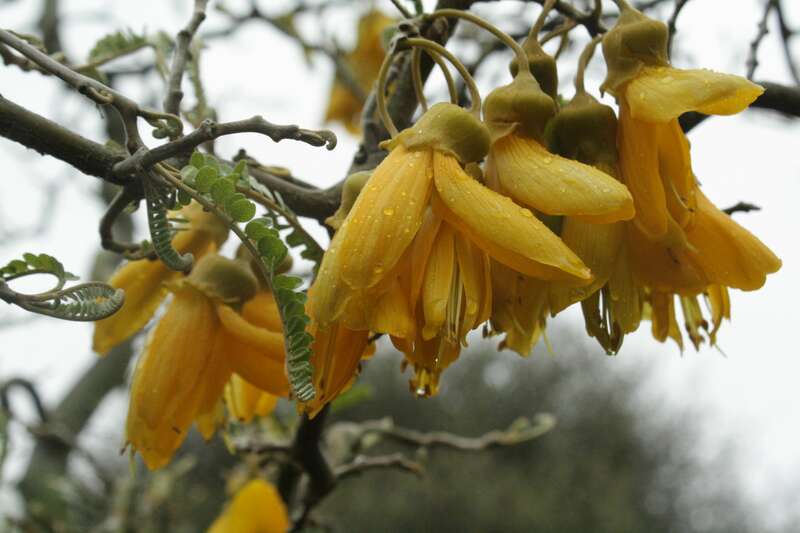 This kowhai grew widely on the plains of Canterbury before the days of sheep farming. The small area of native plantings here at the Tin Shed in Rangitata is a humble attempt to reclaim and preserve some of the beauty and diversity of flora and fauna that once stood here.